A small break from the Portland sketches (many more to come! ), to bring you something I sketched on Saturday afternoon. 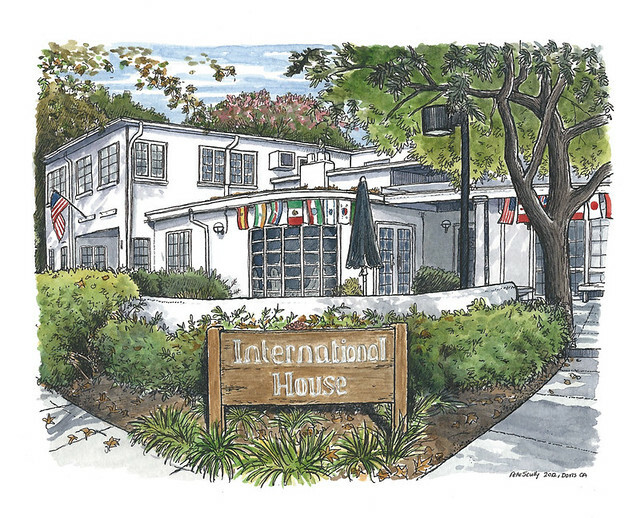 This is International House, aka I-House, one of Davis’s great institutions (for foreigners such as me). 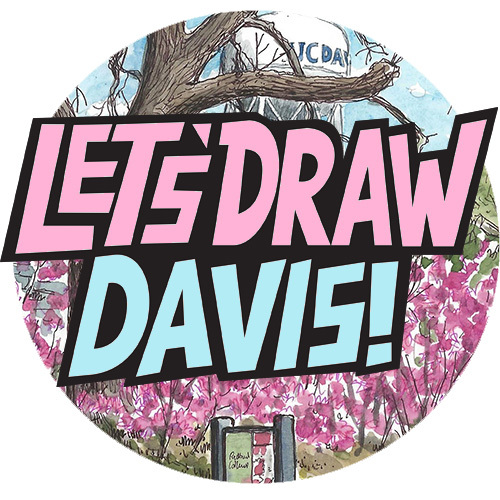 I have been meaning to come by and sketch for a very long time, and finally on Saturday I did, and a nice building to sketch it was too. I haven’t personally been to many events here in the past but I really should. A few years ago when my son was a baby we came to a potluck party here for internationals, which was nice. I brought trifle (that didn’t sit there for very long! My trifle is lovely, I’m not kidding) and we chatted with a friendly German couple, but that was it really, I was shy and didn’t speak much. Still, I like being an international. It’s nice and you get to travel. As I sketched this I listened to the latest History of English podcast, which was about the Greek word horde that has filtered its way down to English, and I was especially pleased because there was a mention of Wulfila (or Wulfilas; it means Little Wolf), the fourth century Gothic bishop whose translation of the Bible from Greek to old Gothic provides us with our earliest example of a Germanic language, and an East Germanic one at that – I loved studying that. Wulfila’s my hero – though his choice of Gothic vocabulary may have been heavily influenced by the Greek rather than what was in general use among the Goths, his work is a massive resource to Germanic philologists. It has been a few years since I read about it all though. In other news…well done Barack Obama!!!! Re-elected President tonight! Knew you could do it!